Elitist Dwight Yoakam "Dwight Trash" Casino Outfit! Dwight Yoakam's combination of Bakersfield country and Mersey Beat pop brought rockers to country and honky tonk to pop music with smash hits like "Guitars, Cadillacs," "Fast As You," "Little Sister," and "Turn It On, Turn It Up, Turn Me Loose." Dwight broke out of the incredible Los Angeles country punk scene in the early 80s with a dash of Buck Owens, a dash of Beatles, and a whole new attitude that shook up country and rock and roll. And his influence still resonates today. We've known all along that Dwight was a big fan of the Epiphone Casino. So together, in collaboration with Dwight and Epiphone's design team, we bring you a Casino that is just like Dwight's music, a breakthrough combination of a familiar tune with a whole new groove, the Limited Edition Elitist Dwight Yoakam "Dwight Trash" Casino Outfit. Dwight Yoakam fans know the Kentucky native is a serious rhythm guitar player as well as a hit singer, songwriter, and actor. Yoakam's classic cover of Johnny Horton's "Honky Tonk Man" featured an acoustic guitar solo--not something you hear everyday! Since then, Dwight has been known to turn up the volume on stage, often using Casinos in his live act and in the studio. 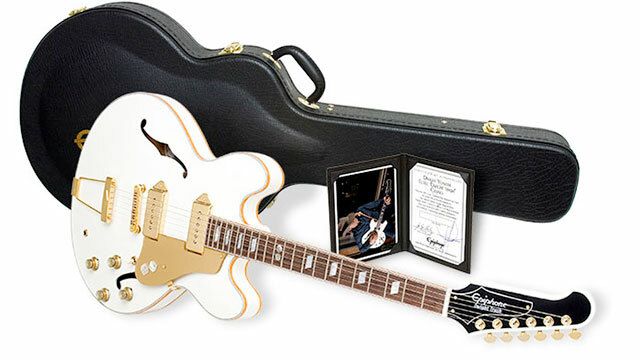 Now, thanks to Dwight's incredible attention to detail and quality, and through special arrangement with Epiphone Japan, the Limited Edition Elitist Dwight Yoakam "Dwight Trash" Casino Outfit gives longtime Casino fans some new and startlingly original features while keeping the Casino's legendary sound just as you remember it. Along with superior electronics and a breakthrough design, the "Dwight Trash" comes in two eye catching finishes new to Epiphone, Jackpot White and Roulette Red. 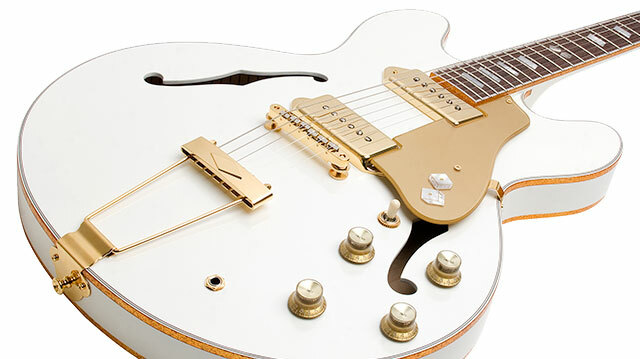 Jackpot White features a beautiful pearl white finish with a fine metallic shine, thin black/white/black binding on the top, and double gold sparkle binding on the body and neck. 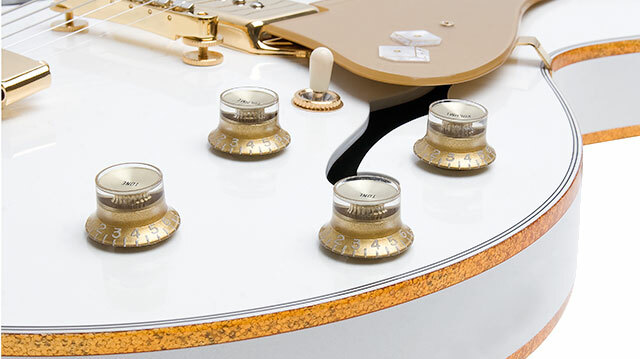 The Jackpot White also features all gold finishing on the pickups, tailpiece, and toggle switch. The Roulette Red is a deep, cherry-like red with beautiful hints of maple grain showing through the finish with all Nickel hardware, pickups and Mini-Grover 14:1 tuners. The "Dwight Trash" features a 5-ply laminated Maple body that follows the time honored lines of the historic Casino. The 24.75" scale SlimTaper™ Mahogany neck is hand set with TiteBond glue. The Rosewood fingerboard features parallelograms with Yoakam's trademark "Snake Eyes" dice inlay on the 12th fret. A 1.68" nut width gives proper string spacing for comfort and tuning stability. The Epiphone Elitist series offers players the ultimate Epiphone experience and the "Dwight Trash" is no different featuring a Gibson USA P90R Dogear pickup in the neck position and a Gibson USA P90T Dogear in the bridge position. 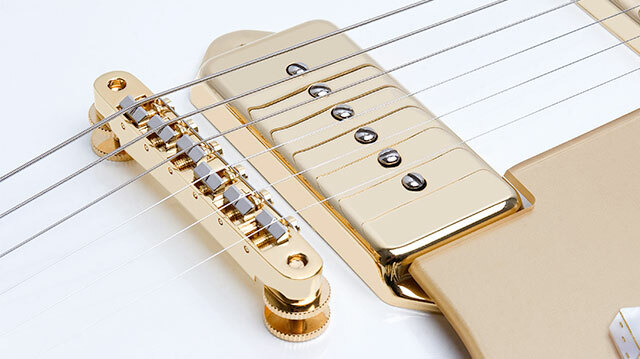 The tone and volume controls are classic vintage style with gold metal inserts with pointers and the 3-way Switchcraft™ toggle is set up for rhythm, lead, and both pickups. The "Dwight Trash" features our standard gold Tune-o-matic™ bridge with a classic Epiphone tailpiece.The pickguard for the Jackpot White is gold ABS with inlaid "snake eyes" dice while the Roulette Red is a 3-layer pickguard (white/black/white) ABS with inlaid "Snake Eyes" Dice. Only 250 Limited Edition Elitist Dwight Yoakam "Dwight Trash" Casino Outfits will be made of each color and each will include an Epiphone hard case and a signed certificate by Dwight Yoakam. And of course, as with all Epiphones, each "Dwight Trash" comes with Gibsonís 24/7/365 limited lifetime guarantee. Get your Limited Edition Elitist Dwight Yoakam "Dwight Trash" Casino Outfit while you can!